Setting up a Simple Drawing: To make it easier to plot a drawing from model space —» File —» New —» select acad.dwt (acad) or acadiso.dwt or caddlt.dwt —» Open —» type LIMITS (define your working area) —» Enter —» <0.0000,0.0000> (lower left corner) —» Enter —» 15,10 (B-size drawing working area) —» Enter —» right-click Grid On/Off icon (bottom right corner) —» Grid Setting —» Drafting Settings —» change the values in the dialog box so it looks like this —» OK —» Ctrl + S (to save) —» save it to a folder (.dwg is automatically add). Drawing Setup: The trickier aspects of using AutoCad. Quick setup really becomes apparent at plotting (printing). Decisions to make about the new drawing: What system of measurement – Metric / Imperial —» What drawing units will be use? —» At what scale – or scales – will you print it? —» What size paper does it need to fit? Or find an existing drawing that was set up for the drawing scale and paper size, make a copy of that DWG file, erase the objects, and start drawing. With this approach, any setup mistakes in that drawing will be inherited. Architectural units are based in feet and inches and use fractions to represent partial inches. Decimal units are unitless — that is, they are not based on any particular real-world unit. With decimal units, each unit in the drawing could represent an inch, a millimeter, a cubit, or any other unit of measure. Engineering units are based in feet and inches and use decimals to represent partial inches. Fractional units, like decimal units, are unitless and show values as fractions rather than decimal numbers. Scientific units are also unitless and show values as exponents, used for drawing really tiny or really large things. Scientific and Micro-Product design such as organic light-emitting diode or organism. Decimal Degrees show angles as decimal numbers and are by far the easiest to work with. Deg / Min / Sec is based on the old style of dividing a degree into minutes and minutes into seconds. Grads and Radians are mathematically usefull but are not widely used in drafting. Surveyor's Units type is similar to Deg / Min / Sec, but uses quater circles (quadrants), rather than a whole circle, where an angle in Deg / Min / Sec might measure 300°0'0.00", the same angle in Surveyor's Units would be represented as S 30°0'0.00" E.
* A great majority of CAD users, the unit types to know and use are Decimal, Architectural, and Decimal Degree. Drawing Scale v.s. Drawing Scale Factor: Drawing scale is the traditional way of describing a scale. Drawing scales are expressed with an equal sign or colon; for example, 1/8" (paper measurement) = (corresponds to) 1'-0" (real-world measurement). In other worlds, the imperial drawing scale 1/8" = 1'-0" means that 1/8" on the plotted drawing corresponds to 1'-0" in the CAD drawing and in the real-world. A metric drawing scale is usually expressed without units, as a simple ratio, 1:20 means 1 unnit on the plotted drawing corresponds to 20 units in the real-world. In architectural and engineering drawings, the numbers usually refer to millimeters. Drawing scale factor is a single number that represents a multiplier, such as 96, 20, or 0.5. The drawing scale factor for a drawing is the conversion factor between a measurement on the plot and a measurement in the real world. Choose a drawing scale —» setup drawing scale factor. ANSI (American National Standards Institute): A (8 1/2 x 11") — B (11 x 17") — C (17 x 22") — D (22 x 34") — E (34 x 44"). Architectural: A (9 x 12") — B (11 x 17") — C C (12 x 18") — D (18 x 24") — E (24 x 36") — Large E (36 x 48"). ISO (International Organization for Standadization): A4 (210 x 297) — A3 (297 x 320) — A2 (420 x 594 mm) — A1 (594 x 841) — ISO A0 (841 x 1189 mm). Margin allowance: Plotters and printers can't print to the edge of the sheet. Annotations: Drawings require some annotations — text, dimensions. grid bubles, and so on — outside the drawing objects plus a title block surrounding the objects and annotations. To prepare your drawing for printing (8 1/2" x 11"/210 mm x 297 mm), switch to paper space. Here you can set up different layouts with title blocks and notes; and on each layout, you create layout viewports that display different views of model space. In the layout viewports, you scale the model space views relative to paper space. One unit in paper space represents the actual distance on a sheet of paper, either in millimeters or inches, depending on how you configure your page setup. In AutoCad, a text style consists of a combination of a style name, a text font, a height, a width factor, an oblique angle, and a few other mostly static settings. Determining the Text and Drawing Scales: When the text you're adding does not specifically label the portion of your design drawn at full size, a feature called layouts makes if possible to set the height of text in the same way at which it will be printed. 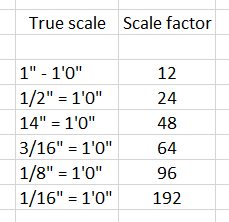 A scale of 1/4" = 1'0" (1:50) has a true ration of 1:48 (1:50) and a scale factor of 48 (50), see table Standard scales and their corresponding ratios. Home —» Annotation panel —» select Text Style button (or enter ST¬ to start the STYLE command —» select Manage Text Styles —» New —» Style Name=A-Title (used for Headings & Titles) —» OK —» select A-Title (to edit) —» Font (Font Name=Arial) AutoCad can use both its native SHX (compiled shape) and Window TTF (TrueType font) files —» Font Style=Bold —» Height=.24 (6.0) —» Apply —» Set Current —» Close —» Save As acad-landscape.dwt (same location) —» Save. Because many people have access to 11" x 17" (297 mm x 420 mm) format printer, we'll use that sheet size. How big an area will fit on an 11" x 17" (A3, or 297 mm x 420 mm) sheet at 1/4" = 1'0" (1:50) scale. The answer is quite simple. Every inch (millimeter) on the sheet represents 48" (50 mm) in the drawing (because 12" divided by 1/4" is 48", and 50 mm divided by 1 is 50 mm). Therefore, you multiply each dimension of the sheet in inches (millimeters) by 48 (50). For this sheet, you multiply 11" x 48" (297 mm x 50) to get 528" (14,850 m m) or 45'4". You multiply 17" x 48 (420 mm x 50) to get 816" (21,000 mm), or 68' (21 meters). So the sheet repreents a rectangle with dimensions of approximately 528" x 816" (14,850 mm x 21,000 mm) at a scale of 1/4" = 1'0", which is usually called quarter-inch scale. Most printers and plotters are not full-bleed devices, you'll need to factor in room for a margin around the outer edge of the sheet. Offset the rectangle .5" (12 mm) to the inside —» Offset —» .5¬ —» select the rectangle —» click the inside rectangle to offset —»the outer rectangle represents the dge of the sheet of paper, and the thicker, inner rectangle is the drawing border. Title Block: The most efficient way of creating a title block is as a separate DWG file, drawn at its normal plotted size (for example, 17 inches long by 11 inches high for a B-size title block, or 841 mm long by 594 mm high for an ISO A1-size. Then insert or xref the title block drawing into each sheet drawing. Model space: Aaccessible from the Model tab and paper space is accessible from the layout tabs. The two spaces are accessible near the left bottom corner of the drawing area: the Model tab and Layout1 and Layout2 tabs. You can add new layouts or copy existing layouts. You can create layouts using the Create Layout wizard or DesignCenter. Each layout can contain different page setup settings. To avoid confusion when transmitting and publishing drawings, it is usually recommended that you create only one named layout for each drawing. Template: A template is simply a drawing whose name ends in the letters DWT, which you use as the starting point for another drawing. When you create a new drawing from a template, AutoCAD makes a copy of the template file and opens the copy in a new drawing editor window. The first time you save the file, you’re prompted for a new filename to save to; the original template file stays unchanged. When you create a layout, you can choose to apply the information from an existing template. A layout template is a layout imported from a DWG or DWT file. 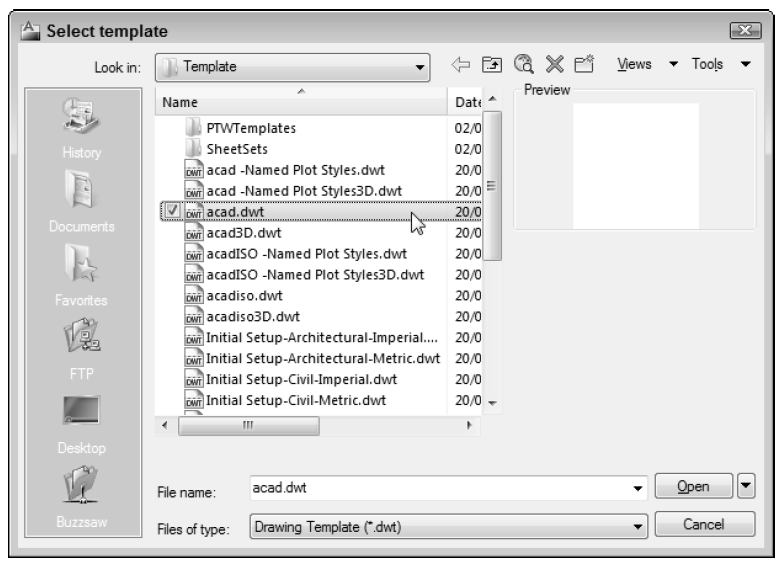 AutoCad has sample layout templates acadiso.dwt (for metric system) , acad.dwt (imperial system) to use when you design a new layout environment. AutoCad templates are probably not setup for the scales to your design which you will need to specify scale-dependent setup information. 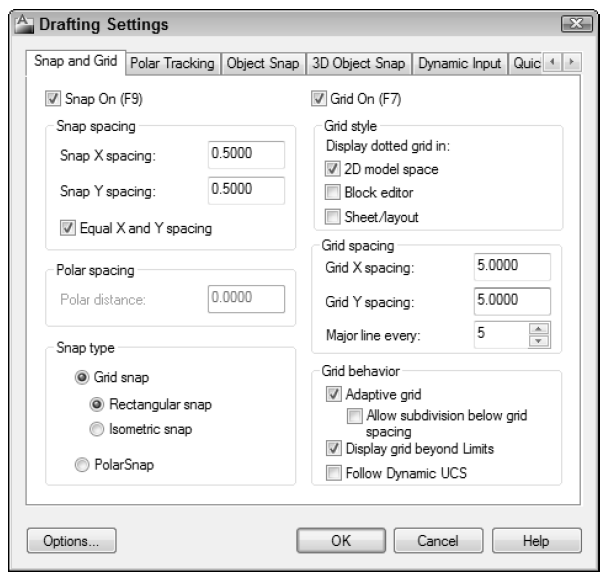 Choose a drawing scale and sheet size to set up the drawing. Most drawings require a two-part setup: 1. Setup model space to model your part. 2. Create one or more paper space layouts for plotting.